I had a female rabbit for about twelve years. When she was about 10 her head went on one side and her ear lopped on the ground. I took her to the vet and he said it was Lop Ear and there was no cure, something to do with the brain. Anyway he gave her medication with a couple of injections and said if she's not better in a week bring her back and she will have to be put down. She never did get any better. I took her back fully resigned to having her put down. I was very upset. But the vet said, "She hasn't got any worse, I'm willing to give her a chance if you are." I was delighted, anything to save my precious Peanuts! He gave her a few more injections and said, "We'll see how she goes!" She was eating and drinking well and not going downhill in any other way. She just went on and on, head dropped to one side and ear lopped over. Then my buck got out and got at her. I grabbed him off but it was too late; he had made her pregnant. She went on to have a litter of 10 kits, her 10th litter. She was a terrific mother and reared them all. She lived on for 2 years after this and seemed quite happy. She died of something non related. I just thought this was an interesting story. Rabbits are tough, never give up on them. Lovely story Dawn, thank you for sharing it! In the USA we call that condition Wry Neck, or Head Tilt, and yes, it is a symptom of a brain or inner ear infection. 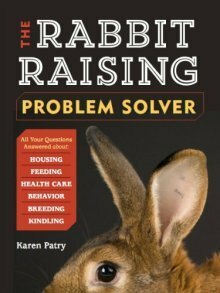 Typically the rabbit worsens and then dies, which is why the vet kindly suggested euthanasia if the rabbit didn't get better. It is very encouraging to all rabbit owners to hear stories that turn out much better than the usual course of this rabbit disease.